Porsche Design was founded in 1972 by Ferdinand Alexander Porsche, one of the principal designers of the Porsche 911. Their first product was a matte black chromed steel chronograph. high-quality workmanship, which combines artisan tradition with state-of-the-art technology. Porsche Design has designed bathrooms, washing machines, furniture, knives,TVs, desk lamps, tobacco pipes with air-cooled engine inspired fins, pens made out of brake lines, computer monitors, computer external hard drives, coffee makers, and even a grand piano . The products are designed at the Porsche Design Studio in Zell am See, Austria. A sought-after style icon, P’8478 sunglasses were designed by FA Porsche and was Porsche Design’s first foray into eyewear. The design of this classic item has remained unchanged since 1978, the only difference being the use of ultra-light titanium. 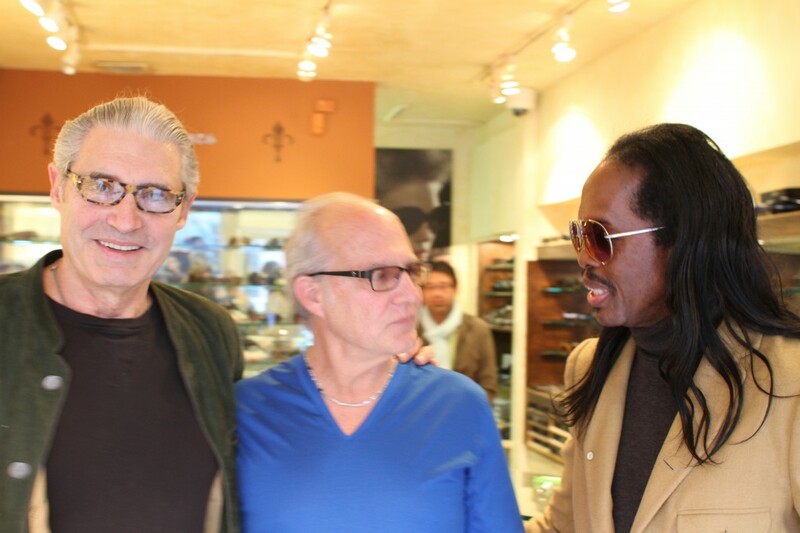 Porsche Design Eyewear is manufactured in Japan and Italy. We’ve loved the original Porsche sunglasses when they first came out in 1978, and we’re happy to say that back in a big way! Even better than they were before, the design is now rendered in titanium and so they’re lighter and more comfortable. The design will always be a classic. One look at these inspiring pictures on our friend Jennifer Stano David’s instagram say it all. Jennifer is a fashion icon, wife, mother, swimsuit designer, blogger and reality TV personality (she appeared on TLC’s “Secrets of a Trophy Wife”). Recently Jennifer snapped a few selfies in her Porsche sunnies and was kind enough to mention us as well. The Porsche aviators have interchangeable lenses to suit your mood. We custom-made these gradient blue lenses for Jennifer to match the azure waters of the Mediterranean. What color is your mood? 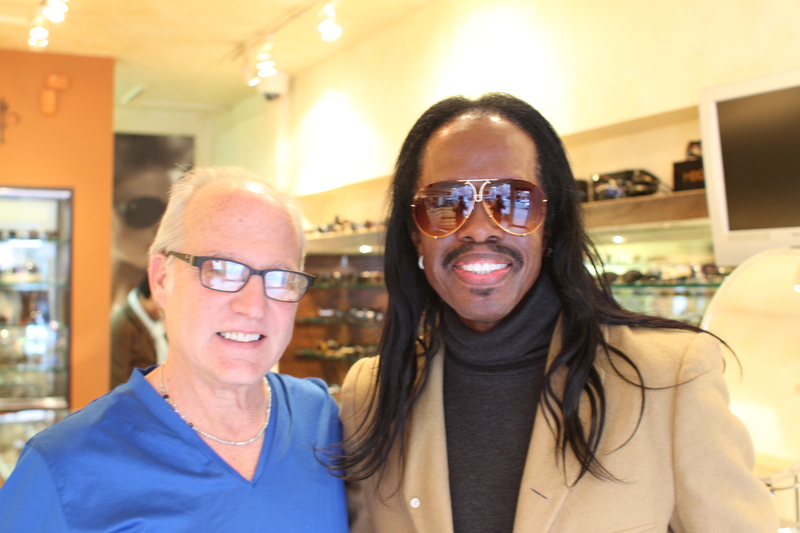 It was another typical day at Dan Deutsch Optical Outlook, Beverly Hills. 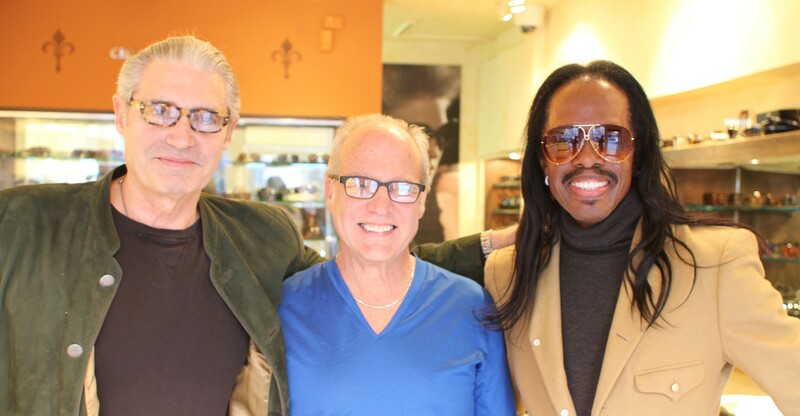 Actor Michael Nouri was pleased to run into long time acquaintance, bassist Verdine White of Earth, Wind & Fire in the store. Dan had told White that he wanted to make him a custom set of gradient lenses for his vintage Porsche Carrera’s that recall a tint he once crafted for Neil Diamond back in the seventies. It’s always great to see friends get together.